The point of this keynote was to describe Realistic Mathematics Education from the experience of two of its strongest proponents, Frank Eade of the Cayman Islands and David Webb of the United States. 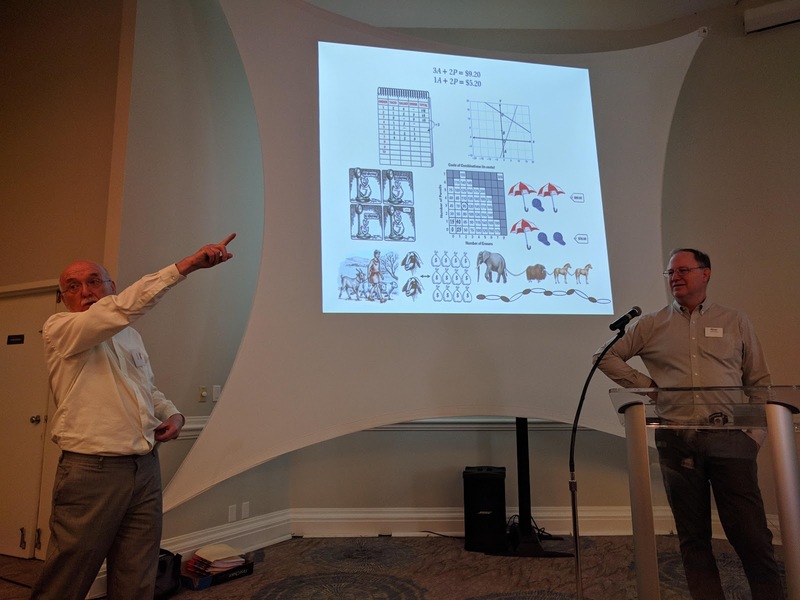 With Grand Cayman as a new location for this conference, and many educators coming to an RME conference for the first time, the keynote was designed to describe experiences that any math teacher could relate to. Frank described his early experiences as a math teacher in the UK. There were influences of New Math from the US, and a sense that things could be changing, but the expectation was to teach traditionally. David's early experiences as a teacher, teaching high school in 1980s Los Angeles, was that instruction was largely teacher-oriented. People talked about group work, but not without much of a sense of purpose. People focused on procedure and problem solving only came at the end after the procedures had been learned. Frank began to learn about dilemmas with students' mathematical experiences. For example, if you ask students to put 0.375, 0.7, and 0.32 in order, many students will say 0.375 is the smallest because it has thousandths, and thousandths are the smallest. Frank read this in research and didn't want to believe it, so he tried it with his own students. They replicated the research, revealing to him that he'd been totally unaware of their misconceptions. He talked to them about why they believed what they did, and got answers like "It's a bit like negative numbers --- the smaller it is, the larger it is." David knew he could organize his entire curriculum around a procedural textbook and hand out worksheets. Students didn't seem to mind and figuring out how to do group work seemed like an uphill battle. Change meant fighting the didactical contract students had formed with their math teachers over many years. Frank's first experiences with RME came when he visited the University of Amsterdam and some schools there. He observed 7/8 students comparing 2/3 to 3/4. He figured students would answer as his would -- that the fractions were the same because in each fraction you could add one to the numerator to get the denominator. Instead, he saw students drawing pictures and using those pictures to argue their reasoning. The only student he observed who reasoned incorrectly was someone who recently moved there. He started to become a convert. David entered graduate school after 7-8 years of teaching and ended up at Wisconsin with Tom Romberg. His assignment as a grad student was to align every activity in Math in Context to the NCTM Curriculum Standards. There were 30 MiC units, so it was a lot of work, but it gave him a detailed look at RME's approach to curriculum design. Sometimes he was in disbelief about the kind of reasoning that was expected of students before procedural understanding had developed. But as he observed students in classrooms, he became a believer as students approached problems informally but expressed all the reasoning they would need to understand the problem formally. Frank's experience with RME curriculum design was part of a MiC pilot. A teacher who was supposed to try a unit for 3 weeks ended up stretching the unit for 10 weeks because kids were so engaged in all the mathematical reasoning -- and because they all had a lot to learn about how to implement and pace a different kind of curriculum. This led to multiple grant-funded projects both to develop new curriculum and to study its implementation. David's experience with design in RME came at the end of the MiC project as focus shifted to implementation and assessment. He had the opportunities to travel the country and offer PD and learn from teachers who needed support to understand the principles of RME and, maybe more importantly, to redefine the roles of teacher and learner in their classrooms. Frank gave the above problem to a group of students with experience with RME, but they were scared of the symbolic notation. Then one student in the room said, "Wait, it's hats and umbrellas!" (a problem in Math in Context) and the rest of the class caught on and they were able to reason with the mathematics. They had seen the hats and umbrellas problem 2 years before, but the reasoning had stuck with them. David's work with assessment bridged the divides between RME and formative assessment. It was yet another way to rethink what it meant for students to understand mathematics. David began to promote the use of the assessment pyramid, even for teachers to think about how they arrange the bulk of their assessments they use in their classrooms. "Students are capable of solving fascinating problems -- we just have to ask them." Frank was talking to his wife about math and asked her to explain how she got an answer to a particular fraction problem. She said, "I cheated. I imagined it, but I know I'm supposed to find the common denominator." Here in the Caymans, Frank has worked with students who have struggled but are now seeing the math in their worlds in new ways. RME isn't totally different from other approaches to mathematics, but some distinctions are useful. It's important for teachers to see their role in orchestrating students' mathematical experiences, and not just facilitate. The use of models is fundamental to RME's design, and teachers need to understand that approach to be successful. When Frank introduced RME to the Caymans, he first visited every classroom to get a sense for the current state of math education on the islands. Staff turnover tends to be high in the Caymans. He found that many children didn't have a sense of shopping and the values of things, so those were opportunities to work those contexts into the curriculum. Students needed more support, so they introduced Mathematics Recovery. Interventions outside the classroom were far more fruitful in helping students because teachers struggled with interventions within the classroom. They employed lesson study to help teachers understand how lessons could be taught, and to address their own experiences with traditional instruction. At the end of primary in 2011, only 25% of students were expected and only 5% were above. At the end of primary in 2018, 62% were expected and 25% were above. That said, Frank says there is great danger in looking at scores like this too much, as we don't want teachers to become too focused on exam success as a measure of achievement.